Saturday, August 17, 1pm-4pm, DOLCE VALLE CHEESE TASTING at The Happy Gourmet (Valsayn, Trinidad). “Come by and find out more about their wonderful products and sample some delicious cheeses. The featured cheeses will include Dolce Valle’s’ Mozzarella and Caciotta (aged cheese). They have also incorporated spices and Dolce Valle farm-grown herbs such as Rosemary and Pepper into their cheeses.” Link to Facebook event. 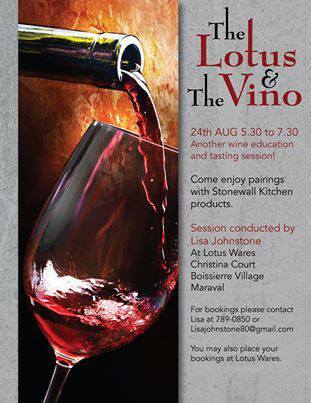 Sunday, August 25, GOOD FOOD GOOD WINES Dinner at the Villas at Stone Haven (Grafton, Tobago). Contact La Tartaruga Restaurant for more details at (868) 639-0940. Food & Wine Events in Trinidad & Tobago Aug 15-30, 2013 – come on people you MUST attend this! Barbados, Bermuda and many island have this awesome event, we have to get TnT’s up there!